“200,000 to 400,000 deaths per year from preventable harm in hospitals” reports “A New, Evidence-based Estimate of Patient Harms Associated with Hospital Care” published in the Journal of Patient Safety September 2013. Yet, with the notable exceptions of The Wall Street Journal, Scientific American and a tiny handful of other sources, the Main Stream Media is silent on this critical issue. “When there is a plane crash in the U.S., even a minor one, it makes headlines. There is a thorough federal investigation, and the tragedy often yields important lessons for the aviation industry. Pilots and airlines thus learn how to do their jobs more safely. With 200,000 – 400,000 deaths per annum Medical Errors are now the 3rd leading cause of death right behind Heart disease with 597,689 deaths per annum and Cancer with 574,743 deaths per annum. Doesn’t the CDC have a responsibility to tell you that occasionally seeking conventional medical treatment will kill you faster than driving your car (34,080 deaths by auto accident 2102), day in and day out every day of your life? (Read an excellent rebuttal to the above MSM (Main Stream Media) rubbish here on GreenMedInfo in an article titled “There is No Scientific Consensus on GMO Safety” by Jonathan Latham, PhD). The World Health Organization, the CDC, the Food and Drug Administration (FDA) and the American Medical Association all are involved in the biggest cover up of the century. “To what end?” you might ask. The self interests and profiteering of the Medical Industrial Complex. 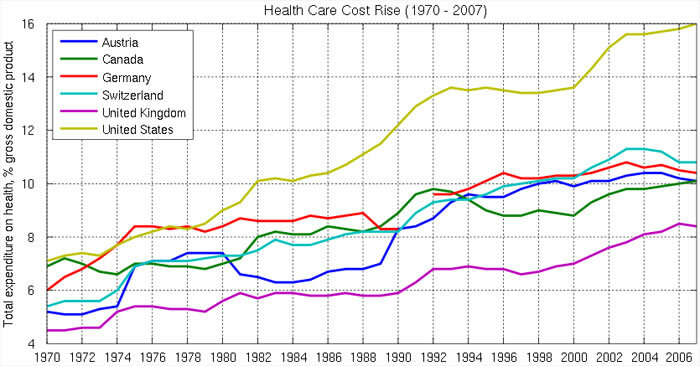 The US has the highest expenditures on health as a % of GDP in the World. In 1961 the outgoing President Dwight D. Eisenhower, warned the nation and the world of the dangers inherent in a Military Industrial Complex. And for good reason. One only needs to glance at the headlines in the newspapers on any given day to confirm Eisenhower’s presentience in the dangers of allowing the intertwining of self-serving corporations and the Pentagon. However, the dangers of the Military Industrial Complex pale in comparison to the dangers inherent in the Medical Industrial Complex. According to one estimate there have been 7.8 million iatrogenic (deaths caused by medical examination or treatment) deaths over a 10 year period in the US – More than all the casualties from all the wars fought by the US throughout its entire history. Dr. Benjamin Rush a Founding Father of America and a signer of the Declaration of Independence was right. America’s Medical Industrial Complex has organized itself into an undercover dictatorship and is now “controlling the shots”, in every sense of that expression. And they are more deadly that all of the shots fired in all of the wars that America has ever been involved in. And just like the Military Industrial Complex’s revolving door between the Arms Manufacturers, Defense Contractors, their Lobbyists and Elected Officials, the Pentagon and Wall Street, the Medical Industrial Complex has it’s own spider web interconnecting Big Pharm, Big Agra the Personal Care Products Industry and their Lobbyists to Elected Officials, the FDA, EPA, WHO, the CDC, the AMA and Wall Street. “President Obama isn’t keeping a promise made to require hospitals to report preventable medical errors. In the Big Agra business, Monsanto has recently been successful in lobbying to cover up studies that linked GMO corn with problems in kidney, liver, heart, adrenal gland, spleen and hematopoietic system functions in rats. The journal Food and Chemical Toxicology (FCT) published the study. But in November of 2013, Elsevier, the publisher of the journal, announced the retraction of the study. which incited a group of 28 scientists from six different countries who are outraged over the retraction to write a letter of protest to Elsevier. See: Journal Retraction of Séralini GMO-Cancer Study Is Illicit, Unscientific, and Unethical. In the Personal Care Products industry, which by the way is a “Self Regulating Industry” (meaning it has no government oversight whatsoever), flatly refuses to publish the ingredients of “fragrances” on their product labels. Or when taken to task by citizen action groups like the Campaign for Safe Cosmetics over the toxicity of the ingredients in their products, blithely says that they know that their ingredients are toxic and promise to remove the toxic ingredients from their formulations at sometime in the future. Usually within 2 – 5 years. What other industry, except a “Self Regulating Industry”, could get away with saying; Yeah, we know that we are poisoning our customers, and we promise to stop doing that … when we get around to it? What’s a healthcare consumer to do when faced with this overwhelming level of corruption and profiteering at the expense of their health and lives? There is a silver lining here, if you look for it. Unlike the Military Industrial Complex, where an individual citizen has little hope of changing things on their own, when facing the Medical Industrial Complex you can take control back if you assume personal responsibility for your own health care. 2) Learn to ask good questions! Ask good questions when with your physician and your outcomes will improve. 3) See a Nurse Practitioner whenever available. They have different training, and will spend more time with you (on average) than a physician will. Moreover their patient-centric communication style is associated with improved patient outcomes. 4) Involve your pharmacist in your care. If you have to take prescription medications ask good questions of your pharmacist. What are the side effects? Are there any conflicts with the medications I’m already taking? What are the contraindications (a specific situation in which a drug should not be used because it may be harmful to you)? What happens if I miss a dose? etc. 5) Get a second opinion. And not just from the practitioners of conventional medicine. Consult Acupuncturists, Chiropractors, Dieticians, Herbologists, Holistic Healers, Naturopaths etc. 6) If you have to go visit your doctor or go to a hospital, bring a friend or family member with you to be your personal patient advocate. Eat healthy. Avoid GMOs wherever possible. Eat organic. Take herbs & vitamins. Meditate. Reduce Stress. Develop good sleep hygiene. And last, but not least, Take care of the environment reports Scientific American in a new study that examines the links between environmental degradation and human illness. Ken McGowan is an environmentalist, social entrepreneur & the former leader of the Green Party of Nova Scotia. Ken is a graduate of the U of T with a degree in molecular biology, and is the founder & product formulator of Sinfully Wholesome, a socially & environmentally responsible natural skin care company. Disclaimer: This article is not intended to provide medical advice, diagnosis or treatment. Views expressed here do not necessarily reflect those of WakingTimes or its staff.